IoT edge analytics brings real-time intelligence to devices - IoT predictions 2018: What will the next year of connectedness bring? IoT analytics are one thing. IoT edge analytics are another. Simply put, sending the vast amount of data created by IoT devices and sensors to the cloud simply is neither feasible nor cost-effective, especially when you want real-time results for fast action. 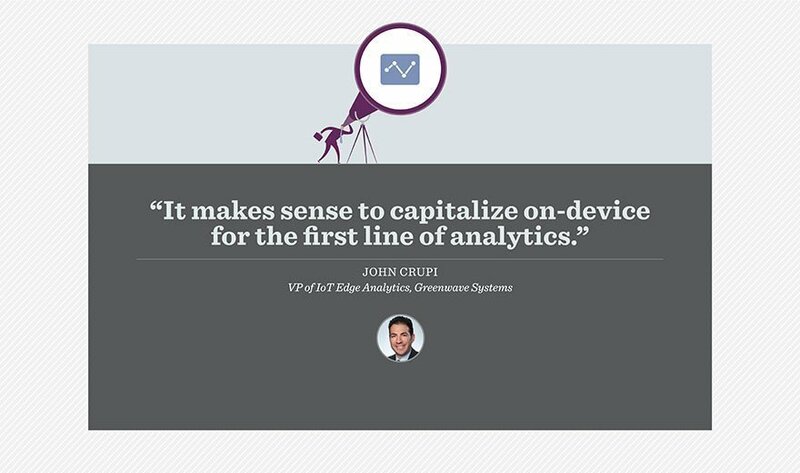 John Crupi, vice president of IoT edge analytics at Greenwave Systems, says the time for analytics at the edge is upon us. "IoT edge analytics will continue to proliferate in connected scenarios. The concept of running analytics on the device or on a gateway (to which one or more devices are connected) is being driven by increased edge processing power and the growing amount of real-time data being trafficked. "Analytics in the cloud is typically associated with big data and batch processing unbelievable amounts of information. But now that we are approaching use cases with millions upon millions of connected IoT devices with credible processing power, it makes sense to capitalize on-device for the first line of analytics, including pattern recognition, anomaly detection and embedded action capability. "The power of cloud analytics is in its ability to use thousands and thousands of processors to split the load and process in parallel to obtain the results. IoT edge analytics takes a similar approach, but upside down -- leveraging all of the edge processor power to do analytics as data is flowing in, and then passing the results to the cloud for further use. By processing at the edge, you not only get real-time results from the source for visualizations and insights, you also dramatically reduce the amount of data which travels to the cloud. This is important not only for cost-conscious cellular connections and overall bandwidth concerns, but it is also highly valuable to real-time and efficient real-time IIoT analytics problems." How has IoT edge analytics improved your internet of things system?